When choosing new hardwood floors for your home or commercial space, there are several factors to consider. The modern hardwood floor that you choose will influence the overall atmosphere and design of the space, so it is important to think through each element that goes into the creation of the hardwood. Modern hardwood floor trends that are currently popular include wide plank flooring, matte hardwood floors, and colour choices such as grey and mid-tone floors. But in addition to these choices, customers also have a wide variety of options when it comes to the texture of the floors they choose. Hardwood floor texture can add dimension to any room’s décor by adding a casual, elegant, or eclectic feel to the space. 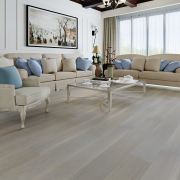 Before you begin your search for new hardwood floors, take some time to think about the style you want for your space. 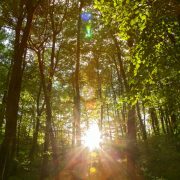 If you are after a specific feel like classic or modern, the type of hardwood grade you will want for your hardwood floor may be an easy choice. Remember, even if you choose a texture that hides scrapes and dents a little easier, it is still important to take good care of your hardwood and avoid unnecessary damage. Let’s take a look at the top options and how they influence design. Hardwood flooring with a smooth finish will add a modern and elegant feel to any room, especially when stained with a dark finish. 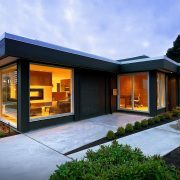 For those looking for a contemporary feel, this finish is a good choice. It is important to note that smooth hardwood floors will show wear and tear more readily than hardwood floors with texture. Hand planned or sawn surface textures can vary from subtle to extreme. These floors will have a more rustic and textured appearance. This texture choice works for more classical spaces as it adds warmth and coziness. The more rustic the texture, the more it will hide scratches and dents. 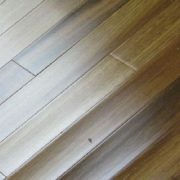 Rustic grade hardwood for nature lovers who appreciate the wood’s natural character. This options offers middle ground when it comes to texture. The texture is achieved using a wire brush and light pressure to create long and linear strokes. 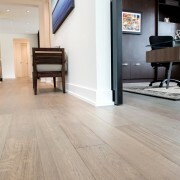 A wire brushed texture really accentuates linear grain woods like oak flooring and makes any hardwood floor just a little bit more complex than a simple smooth surface. This technique produces an authentic, two-toned look that is very stylish but is also able to help minor wear and tear be less visible. 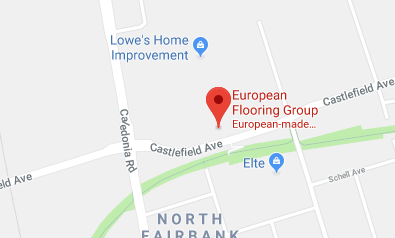 In order to get a good idea of how each type of texture looks and feels, we invite you to visit European Flooring’s Designer Showroom in Toronto. Our display panels are large so that we can truly showcase the options available and provide you with a better understanding and appreciation of the way the flooring may appear in your space. Our professional staff is ready to help you select your new hardwood floor and make it as easy and understandable as possible. We’d love to help – contact us to request a design consultation.